John Sidney McCain III was born on August 29, 1936 in the Panama Canal Zone. His early life consisted of his two siblings Joe and Sandy McCain and attending 20 schools before graduating high school. After he graduated Episcopal High School in 1954, he entered the United States Naval Academy, became a lightweight boxer. With a high IQ, he graduated in 1958. On July 3, 1965, he married his first wife Carol Shepp, adopted her two children Douglas and Andrew and had a child of their own named Sidney. 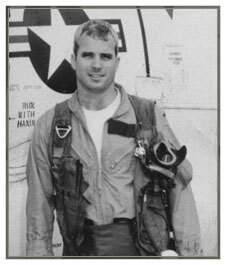 In mid-1967, McCain entered the Vietnam War and was assigned to a bombing campaign known as Operation Rolling Thunder. After an accident that killed 134 sailors and put his first aircraft out of commission, McCain volunteered to work with another aircraft and continue the operation. On October 23, 1967 after flying his 23rd bombing mission over North Vietnam, he was shot down by a missile, and taken as a prisoner of war. In 1968, he was beaten and tortured for 2 hours at a time until he made a confession about anti-United States propaganda. McCain was finally released from the prison on March 4, 1973 after nearly five and a half year of being tortured to the point where his war injuries left him permanently unable to raise his arms above his head. He was awarded the Navy Commendation Medal and a Bronze Star Medal for his bravery and mission flying over North Vietnam. John McCain during the Vietnam War. John McCain met Cindy Lou Hensley in April 1979 and the two began dating. After asking his wife for a divorce to which she finally complied, McCain and Hensley married on May 17, 1980. After retiring from the Navy on April 1, 1981, and receiving disability pension and a plethora of awards such a the Prisoner of War Medal, McCain had his sights set on running for congress. 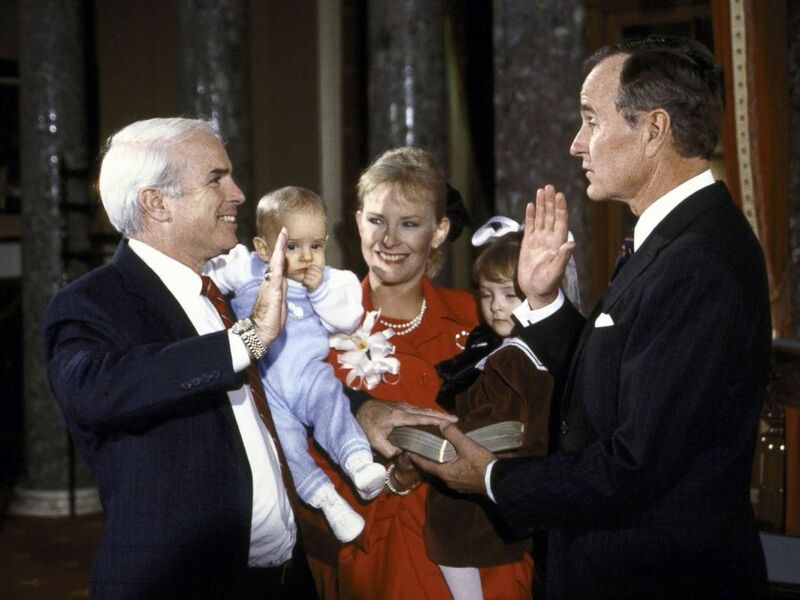 Cindy and McCain had their first daughter Megan in 1984, followed by their son John Sidney IV, and their son James, and adopting their daughter Bridget from Bangladesh in 1991. In 1986, he became Senator a title he would hold until the end of his life. John McCain standing along with his family. After his two full successful terms as senator and being re-elected for a third, John McCain announced on September 27, 1999 he would be running for president, however he dropped out on March 9, 2000 after losing nine out of thirteen primaries. He went back to finish his third senate term and supported George Bush even after the September 11th attacks. He ran for president again but went on to complete his fourth term as senate after losing to President Barack Obama in the 2008 Presidential Elections. After completing his fifth term as senator, he went on to compete his sixth and final term. 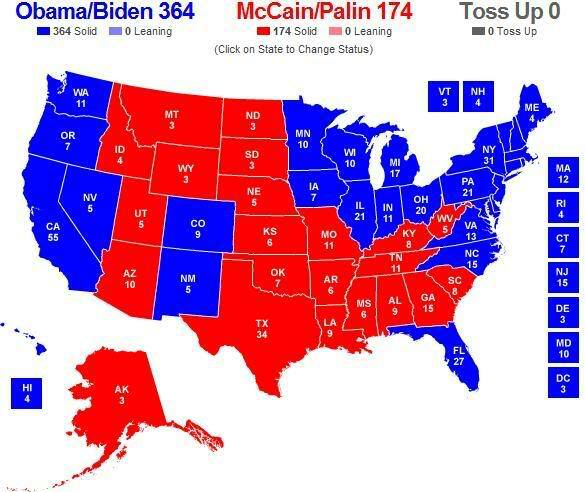 The race results between Obama and McCain in 2008 for president. After John McCain went to receive surgery to remove a blood clot from above his left eye on July 14, 2017, the test results unveiled an aggressive brain tumor. Not knowing how long he had left to live, he returned to the senate to vote for the Obama Care act less than two weeks later. After December 2017, he no longer voted in the Senate and returned to his home in Arizona to continue treatment for his brain cancer. On August 24, 2018, the McCain family announced that John McCain would no longer receive treatment, and he passed away on August 25, aged 81. Although his life was filled with hardships, he always did what was best for the country. He even was called a maverick for going against some of his beliefs for the good of the country, and or that he will always be remembered. Senator John McCain served Arizona on Capital Hill for 30 years.